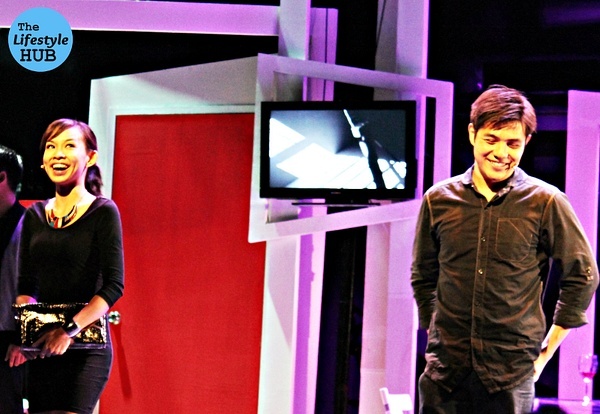 For several sequences in the play, the groundbreaking love story of Popoy (John Lloyd Cruz) and Basha (Bea Alonzo) were discussed in Culture Shock Productions' newest stage venture. 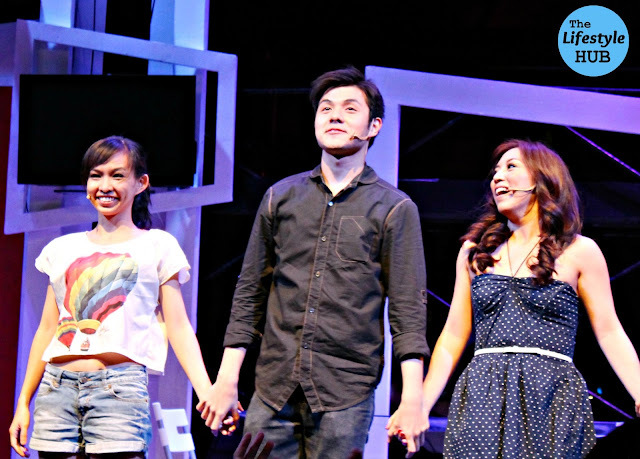 With the musical written with Sugarfree's songs as its backbone and with the plot narrating the common romantic issues of today's youth, 'Sa Wakas' charmed its way through- setting the same tone of kilig and honesty as what we've seen and felt in 'One More Chance' but with a totally different story. and realizations in "Sa Wakas". I admit expectations were set high after reading good reviews from several blog and news sites. The cast and the crew of 'Sa Wakas' might have breathed fresh air after reading all those but it's a good thing the good words did not make them feel lazy. The production might not be that extravagant but for what it really needed, the three lead cast powered up with big vocals and unassuming characterizations (means no overacting) that your attention will be transfixed on them and on the four support actors all through out. 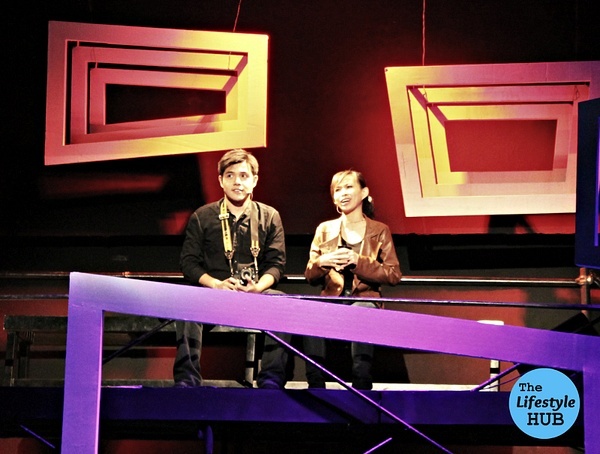 Fred Lo portrays Topper, up-and-coming photographer struggling to find himself and better his relationship with Lexi as performed by Caisa Borromeo. Lexi is a young doctor, a perfect representation of today's overachievers and as expected, struggles in balancing her career and relationship. Then there goes Gabbi, acted out by Kyla Rivera, a magazine editor trying to rekindle her passion for the art. With this set of characters, I bet no one can tell me that they're not far from who we are in the real world. Exposed perhaps to pop culture and with the actors finding a great deal of themselves on their characters, portrayal went so easy for Lo, Borromeo and Rivera. After seeing him as Rolf in Resorts World Manila's The Sound of Music, it was my first time to see him on stage for so long. And he did not disappoint. "I pushed myself too hard", says Lo in an interview after the show. "The songs were set on high notes and I tried my best to sing them the best way I can", he added. Though her voice can be screechy sometimes especially with the high notes, Rivera, astonishingly symbolized the hopeless romantic but trying-to-be-wise modern girl. Borromeo, on the other hand, fared better vocally and stood with more visibility on stage. Or maybe, it's just because her part has more appearances. Regardless- the three actors did well. 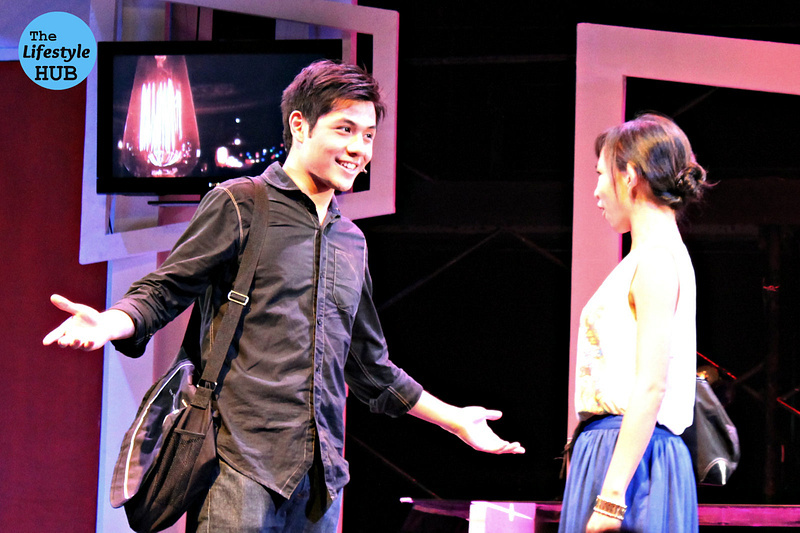 If you're the type who wants to take a break from period theater shows or remakes and wants to dive into a romantic, lightweight but more enjoyable material, 'Sa Wakas' is for you. It would be a bonus if you're a pop/ rock fan. In entirety, it's a good chance to dwell into what could be your romantic dilemmas: infidelity, honesty, of finding one's self, balance between work and relationship, and of knowing when and how to let go. It would be best to realize all that in a witty and youthful exchange of lines with a dose of the great Sugarfree catalog. 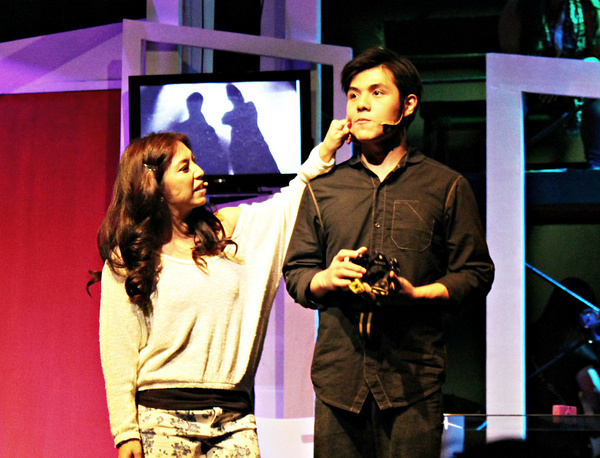 'Sa Wakas' is down to its last 5 shows: April 26, Friday, 8PM; April 27, Saturday 3PM and 8PM; and April 28, Sunday, 3PM and 8PM. Ticket details are posted here: www.sawakas.com.